With the essays traded between Daniel Dennett and Sam Harris, free will is back in the web conversation. I wasn’t planning on making another free will post myself, having been mostly satisfied with my previous statement on it. But I’ve had a few conversations lately, both here on the site and in some other mediums, that made me realize that there are additional points to be discussed. First, let’s be clear about something. Libertarian free will, that is a will free of the laws of nature, or free of God’s will, isn’t really part of this particular debate. The people most dismissive of free will tend to be passionate atheists, and libertarian free will is the one they’re usually aiming at, primarily due to its use by religious apologists as an answer to the problem of evil. For people vested in theological debates, libertarian free will may seem like the only version of free will worth discussing. If we don’t have it, aren’t the other versions just attempts at trying to save appearances? Aren’t they just about people clinging to the term “free will,” simply afraid to face the reality of the situation, to bite the necessary philosophical bullet? To answer that question, let’s think about an important clarification that Sam Harris, Jerry Coyne, and other incompatibilists usually make. As determinists, they note that our choices are determined by the laws of physics. However, they are careful to say that this shouldn’t imply fatalism. Of course, Harris and company don’t buy this, and they’re right not to. They are determinists, but they are not fatalists. It isn’t necessarily that the fatalists are factually wrong, it’s that their outlook isn’t productive. Our actions will contribute to determining our fate. It’s of no help when actually weighing the choice of possible actions to be preoccupied with the fact that the choice is already determined. The choice still has to be made. But what shall we call this position, the position of accepting determinism, but not fatalism? We could call it “determinism but not fatalism”, or “anti-fatalist determinism.” Or we could use the label that most philosophers use, and call it “compatibilism,” that is, a recognition that determinism and acting as though we have useful choices, is compatible. Compatibilism isn’t so much an assertion about what reality is, but about how we should approach that reality. This is why, despite scientific advances, free will very much remains a philosophical issue. Is compatibilist free will a productive concept? Does it make sense to say free will exists? Isn’t it just an illusion, since we know that it ultimately isn’t a real thing? That depends on what we mean by “real”. Is this blog entry a real thing? This web site? You could argue that they are illusions since ultimately we know they don’t really exist, but are really only collections of magnetic patterns in a data center somewhere. Ultimately, what is real? Technically, everything we consider real are just patterns of fermions and bosons. Even fermions and bosons themselves might eventually turn out to be patterns of something else. The universe may be patterns, structure, all the way down. Everything above that brute fact layer is emergent. (If there even is a brute fact layer. It may all be emergent.) Does that mean we should regard it all as illusion? From a pragmatic standpoint, to avoid endless navel gazing, we are forced to accept the existence of many patterns as realities, despite the fact that they are emergent phenomena. We do this because it is productive to do so. Is the concept of compatibilist free will productive? Perhaps not if you’re a fatalist, such as a Calvinist or an extreme reductionist. But to anyone who thinks there’s something to the notion of taking charge of our own lives, it remains a useful philosophy. In the end, that’s how it should be judged. Harris, Coyne, and others often cite as their motivation the elimination of punitive justice. If someone is not “morally responsible”, they argue, then we shouldn’t want to make them suffer simply as a revenge mechanism. The thing is, many people agree with this stance against vengeful justice. Among liberals, it’s not a particularly controversial position. Indeed, it’s one that many religious believers would fully endorse under the whole “turn the other cheek” doctrine. So, why all the fuss about free will? Well, as I said above, I think a lot of it has to do with atheist debates with religious apologists. Libertarian free will is one of the theodicies, one of the solutions to the philosophical problem of evil. But a nuanced argument against libertarian free will doesn’t seem nearly as effective as a blunt one against the phrase “free will.” Of course, many other atheists disagree, among them people like Daniel Dennett and Sean Carroll. The result is a largely a definitional debate among naturalists about what the term “free will” actually means. And as I’ve written before, the problem with definitional arguments is that they tend to be endless and pointless. There are many evils in the world. The term “free will” is pervasive in law and culture. Is the fight to eliminate it really a productive one? This entry was posted in Philosophy and tagged Atheism, Compatibilism, Daniel Dennett, Determinism, Free will, Harris, Jerry Coyne, Libertarianism, Sam Harris. Bookmark the permalink. Philosophers are a small minority. What are we going to do with the 80-90% (?) of the world population that believes in the existence of the soul and in libertarian free will? How can we educate them? Should we even try? For what purpose? These are the questions I’d like Harris, Dennett, and others to address. The rest, as you said, is semantics. I think everyone has to choose their battles. You can’t charge in all directions at once. Scanning this thread, I just realized that some of my replies yesterday probably came across as terse and dismissive, particularly the ones to Olivier and ausomeawestin. Sorry guys, that wasn’t intentional. Those replies were made in a hurry, which is always a bad idea. A lesson I seem to have to relearn periodically. What I was trying to say with my reply was that it’s always a judgment call about how much rationality we can usefully teach. The further you want to move people, the less success you’ll have. We all have to choose where we want to fight our battles. In the last year or so, I think I’ve felt that just encouraging people to think straight in the first place is the best strategy. Consequently, I’m actually fairly satisfied with a religious believer who accepts science, since they’re rarely the source of problems associated with religion. Others disagree. Many are like Harris and Dennett in feeling that we shouldn’t compromise, but should push people all the way. Very interesting way of framing this debate – compatibilism is a theory about “how we should approach reality”. We take many entities as “real” because of the explanatory power their existence provides, as the existence of such entities explain why we observe the phenomena that we do. You say that positing compatibilism is productive, but does the truth of compatibilism have explanatory power? It seems like it explains why we have the experience of making free and voluntary choices despite far-reaching causal chains determining present choices. This might seem to be a win for compatibilism, as the other options deny phenomena that need to be incorporated into and explained in our theory (hard determinists must explain why it seems like we choose when we don’t, and libertarians must explain how a cause can be injected into a closed system). But I think we should be hesitant in declaring a win for compatibilism, as we cannot downplay the difficulty of explaining how choices can be caused by external events and still be free — I am one of those people who think that determinism looks a lot like fatalism (though I am not a theistic libertarian, no sir! ), insofar as Laplace’s demon could know what I would be typing at this very moment all those millennia ago. Laplace’s demon might be stuck with fatalism. Of course, Laplace’s demon is a fable, and as I’ve written before, determinism isn’t as certain as many assume. What I meant by my original reply was that, if we had the knowledge of Laplace’s demon, fatalism would be hard to avoid, but since no one has that type of knowledge, it isn’t a problem for us. However, on further thought, Laplace’s demon wouldn’t have to accept it either. Its perfect knowledge of the future would affect its decisions, altering the future. Of course, it would also be able to predict its own reactions, leading to an infinite recursion. I don’t know if you’re familiar with Frank Herbert’s Dune books, but the first two have an interesting exploration of this question. If someone can see the future, and thus make decisions to alter it, what traps are inherent in that? I agree that the knowledge required would be unattainable, but I’m not sure that fact undermines this idea as a thought experiment. Regrettably I haven’t done my sci-fi homework and read Dune, but I do understand the sort of paradox you’re getting at. After listing all the temporal stages of reflection that the demon goes through we start to wonder whether any one course of events is fixed. I think at first blush your proposal is attractive, but ultimately I think I disagree. I think concluding from determinism that we ought to be fatalistic is straightforwardly and demonstrably incorrect (despite the fact that some such as Massimo Pigliucci appear to be so confused). As such, I think we need no terms for non-fatalistic determinists – this should be the default interpretation of what determinism means. The debate between Harris and Dennett is not about how we ought to react to the reality of determinism, as they both agree here. They disagree over whether the concept of “compatibilist free will” is useful. In light of the fact that so many people are libertarians, Harris thinks it is not, as he wants to be able to argue clearly and forcefully that libertarian free will is incoherent without having to explain the difference between libertarianism and compatibilism every time. 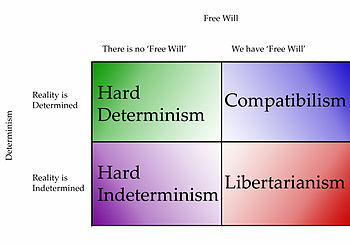 I also think Harris is right that libertarian free will is what is understood by most people when they hear the term. Most people are religious or in some sense spiritual so libertarian free will is no more incoherent for them than many other aspects of their supernaturalist world view. Also, it is unclear what compatibilism really gives us. It fails to meaningfully distinguish between humans and sophisticated robots, and any definition which fails that test is a gross perversion of the concept as popularly understood in my view. I disagree that a label for determinism but not fatalism isn’t useful. It might be a self evident conclusion for you, but from what I’ve seen, the average person perceives arguments against free will as arguments for fatalism. Explaining why it’s not takes lengthy explanations. And those explanations are very similar to why compatibilism is useful. I fear that if anyone is going to tackle this topic, they can’t escape from lengthy explanations. A tweet about free will is endlessly subject to misinterpretation. Yes, we need to explain why determinism does not entail fatalism. But I don’t see how interpreting “compatibilism” as “non-fatalist determinist” is going to help that explanation. I see the value as simply having an elegant label for that position. I’m actually not hung up on the “compatibilist” label itself, but it is the one most commonly used, and it does seem like having some label is useful to avoid a lot of discussion every time we want to mention it. But I suppose that’s a matter of judgment, of philosophy. Compatibilism has never made any sense to me. While a compatibilist believes that reality is determined, he may also believe that his inability to predict the future means that he has the freedom to influence the future. But how, if he genuinely believes in determinism? But it has occurred to me that it may just be the same world from a difference frame of reference. Here’s what I think a compatibilist is: he, as a person, is the sum of his past experiences. Therefore, that which is him (his past experiences which have shaped him), can influence his future. I think this comes from viewing the individual as, not a closed model, but as a cell with a semipermeable membrane. Information can pass inside and be internalized, becoming a part of the individual. Information can be sent from, and become a part of others, influencing their future actions. I think a determinist does not use the metaphor of the individual. He recognizes that everything influences everything else it interacts with. If there is an individual, it is the kernel of awareness that results from conscious processes, and it is being taken for a ride like an infant with an xbox controller without a battery. Does this mean we are not concerned for the future of our children? No. But the reason for our concern is the past experience we have. Do we then try to ensure the best future for our children? Certainly, but that action is based off of our concern, which is based off of our past experience. So, to summarize, the compatibilist clings to the concept of the individual, which internalizes knowledge from outside and makes it his own, and uses it to influence actions, whereas the determinist either has no individual, or that individual is a passenger. I think your distinction between compatibilists and determinists is problematic, as compatibilists *are* determinists. If you have a hard time getting your head around compatiblism, an easy way to understand it is that a compatibilist would say a sophisticated robot has free will (although they may try to weasel out of that admission). For a compatibilist, free will is just a complex deterministic decision-making process. Entities can exercise free will if they are not coerced and if their decision-making process is otherwise functioning correctly. Yeah, that fits with what I was trying to say, but I was going more for it being two different labels for people who hold the same idea about how the universe works, but from different points of view. Compatibilists make the abstraction of an individual and say, “This is how we are,” while acknowledging that this isn’t how it is because an abstraction is necessarily now how it really is. Determinists say, “This is how it is,” but still use the abstraction anyway because it’s damn convenient. The only real difference between the two would be in disciplining the individual versus correcting society. An excellent comment. I do have to point out that an individual is more than the sum total of their experiences. They also have a nature, a genetic profile. We aren’t born blank slates. But, along the lines of the concept of the individual, I don’t know anyone who doesn’t use that concept, even the most mad dog reductionists. Again, everything is an illusion, is emergent, including the self, if you drill down for enough. But is it then productive to dismiss those concepts from day to day life? I chose not to include the genetics, because, if anything, it supports determinism. Like you, I know of no one who does not use the concept of free will to go about their day to day life. Like I said above, it is damn convenient. But in this day and age, you have to ask yourself, is this person a product of our society, or should we hold him to blame? Should we hide this psychopath to keep him from harming others, or should we electrocute him in front of an audience? Are the poor at fault for their unemployment, or is society actively restricting the available options? I think the question of determinism is immediately relevant to how we live today. The abstraction is useful, yes, but ignoring the bits underneath the abstraction is actively harming us. I agree. I think it’s a central tenet of liberalism that people are much more the victim of circumstances than conservatives ever want to admit. There but for the whims of chance go any of us. Still, “blame” often has a useful role. We just need to be as accurate and as merciful as we can when assessing it. Relating to a prior conversation, has it occurred to you that things at the quantum level being described by probability seems an awful lot like an abstraction of something on a lower level? Meaning that, while we treat these things as being random, they could very well be just as deterministic as anything else. It has, and I did some reading on it a while back. Albert Einstein was a strict determinist. It was his position that quantum mechanics had to be an incomplete picture, that there were hidden variables, variables that if we only understood them, would render QM deterministic. I won’t pretend to understand exactly how, but apparently the hidden variables theory has been experimentally ruled out. I think it has to do with a demonstration, with any underlying variables, that you end up having to give up either causality or locality. Oh delightful. Bell’s theorem if you’d like to read. I’m in no position to dispute in any way, so I’ll just take it and be pleasantly surprised if it somehow turns out to be wrong. SAP is right: the hidden variable interpretation seems not to work due to Bell’s inequality. The Many Worlds Interpretation of QM on the other hand is both viable and deterministic. The wavefunction of any system evolves determinstically, and it never collapses. What we perceive as randomness is only due to our place in the quantum multiverse – there is a copy of you for every possible way the quantum dice could roll, and since all of these copies exist there is actually no randomness from an objective point of view.